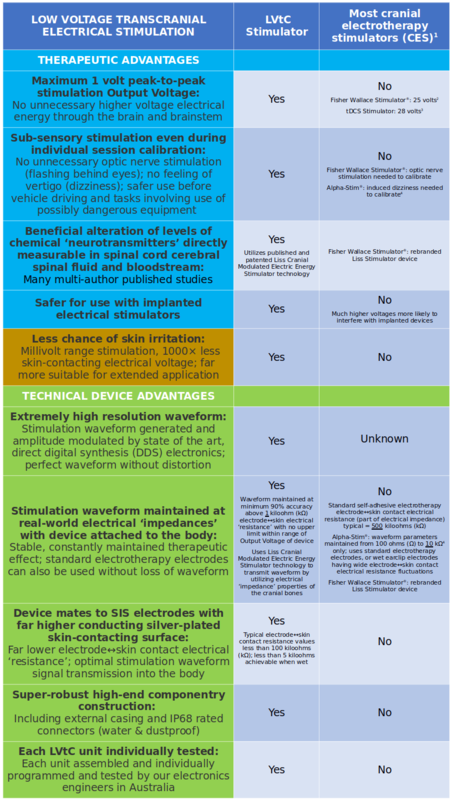 Enhancing Brain Neuromodulation. Gentle beneficial effects on levels of neurotransmitters including Serotonin—related to mood, sexual function, appetite, sleep, memory, learning and some social behavior, and Melatonin—related to sleep-wake cycles, and on Cortisol and DHEA—adrenal stress and steroid hormones. Brainwave Augmentation. Delivered stimulation frequencies are in the Beta brainwave band of the normal waking state of consciousness of focused activity, decision-making and general alertness. Central Pain Modulation. Beneficial effects on levels of ‘neurotransmitters’, Beta-Endorphin and GABA—related to transmission of pain signals and the body’s natural pain relief mechanisms. Low Voltage Cranial Electrotherapy. Far lower (1000×) milli-volt range stimulation achieves comparative or greater therapeutic effects than high voltage devices (typically: 20-30 volts). Safer, wider application, less risks of side effects, no unnecessary optic nerve stimulation or dizziness. Easier and more comfortable application—no wet sponge pads, tingling or burning under pads; less chance of skin irritation. 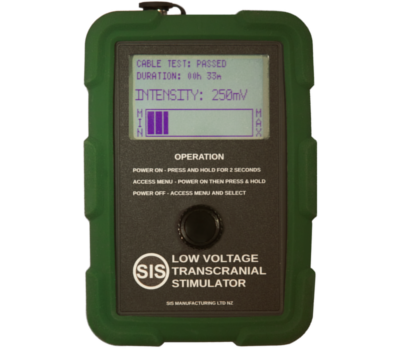 Advanced Cranial Electrical Stimulation (CES). Technological development of the Liss Cranial Modulated Electric Energy Stimulator USA patents. Higher precision, more targeted, state of the art digital electronics generated and amplitude modulated stimulation waveform. Waveform is maintained even at real-world, higher electrical circuit resistances encountered when attached to the body. Far higher precision user-adjustable stimulation intensity. For clinic or home use. 2. Measured on our high-end oscilliscopes. 3. Published specifications from device operating manual, v1_3_a. 4. Published specifications from device operating manual, revision C, 2013.